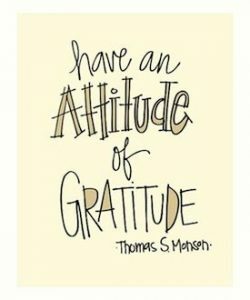 Why is gratitude so important? Do you know how to show gratitude to loved ones? What about people you work with? What about yourself? Are you in the habit of expressing gratitude to others? Think about how many times each day you say thank you to someone? If a person holds a door for you, do you recognize the gesture with a “thanks?” If a co-worker helps with a task, do you thank that person? On the other hand, do you hold onto your expressions of gratitude until someone does something “big?” If so, think about how often people actually do “big” things for each other, while we each help each other with “small” things all of the time. How often do you tell someone when they’ve made a mistake? At home, perhaps you may point out mistakes that your kids or significant other make pretty often. At work, probably much more frequently. How often, on the other hand, do you take the time to express gratitude to those same people? When was the last time you wrote your parents a note expressing gratitude for their help (for instance, if they help you watch your kids)? Do you only wait for big “wins” at work before expressing your gratitude to a co-worker? Why care about expressing gratitude? It feels good when someone thanks you for doing something, and it also feels good to be the person who gives the gratitude. Beyond feelings, however, think of how much more likely you are to help someone in the future if that person offered a sincere expression of gratitude the last time you helped them. Be sincere, humble, be honest. You want the gratitude you express to be as meaningful as possible, so be specific. Instead of just saying “thanks,” say “thanks for doing _____.” This will be so much more impactful for the recipient, and they will remember what specific action caused them to receive your gratitude and will be likely to repeat that action in the future! Companies large and small can implement recognition programs that will ensure gratitude is being given to everyone at all levels of the company. These programs can be of varying degrees of formality, and do not have to involve money. In fact, if your goal is to create a culture of gratitude, then money will likely undermine that effort. Concentrate on simple things such as making sure that every project ends with some form of recognition for efforts (whether over email, a card posted on a bulletin board, or verbal recognition so that others can hear it). If you are not ready to make it an official program, just do it yourself to model the behavior and chances are that it won’t take long before others follow your lead. We created the downloadable “JG” JOURNEY TO GRATITUDE Journal™ to remind you to look for ways to express your gratitude in every situation and then do it! Download it today and start creating a habit of showing gratitude to others! Are you stingy with your gratitude or do people tell you to “stop thanking me, already” because you do it so often? Let us know by leaving us a voicemail at 646-653-9278 or sending us a message here.